Some kids Growin’ Up in Maine in the 1950’s liked the bubble gum that came with packs of baseball cards more than the cards. 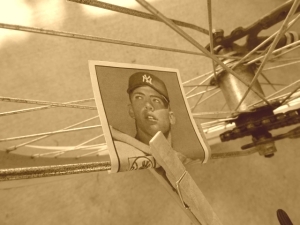 We never realized our error using a clothespin to create a $5000 Mickey Mantle bicycle motor. The card in the photo shown is a Mickey Mantle 1952 Topps card pinned to the bike to create a flap-flap-flap noise against the spokes as we rode around Derby, Maine. That same card today goes for $5000 to $20,000 depending on the condition. His real rookie card was a 1951 Bowman that goes for far less nowadays. What a shame we didn’t have a crystal ball for sports or other collectibles like comic books. Just imagine. 100 of those Mantle cards would be worth a half million dollars in 2012, or more. I do own a personalized baseball with Mickey Mantle’s autograph signed in person in February, 1991. The price was $55. The wait was 6 hours. Mantle died 4 years later having earned more in personal appearances signing memorabilia at card shows than he ever made in his baseball career. The autographed Mickey Mantle baseball is worth up to $400. Unlike his card kids pinned to flap in the spokes of a bicycle in the 1950’s, that baseball won’t be used or abused for batting practice.